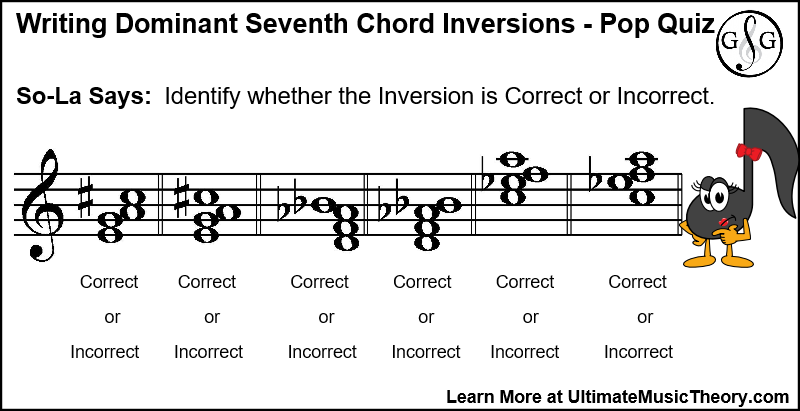 Dominant Seventh Chord Inversions have specific rules regarding Note Placement. In other words, there is a correct and an incorrect way to write these chords. In this Blog, we will learn the 4 steps to correctly write Dominant Seventh Chord Inversions every time. We will also learn about the 1 tip to discover if your inversion has been written correctly or incorrectly. 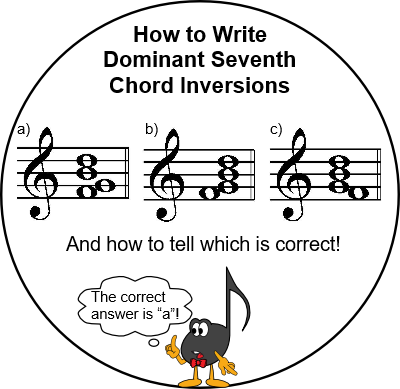 In the Ultimate Music Theory LEVEL 7 Supplemental Workbook beginning on Page 33, we made certain to clarify how to properly write Dominant Seventh Chord Inversions. In this Blog, I will review the 4 steps that make it easy for me to write (and teach how to write) a proper Dominant Seventh Chord Inversion. 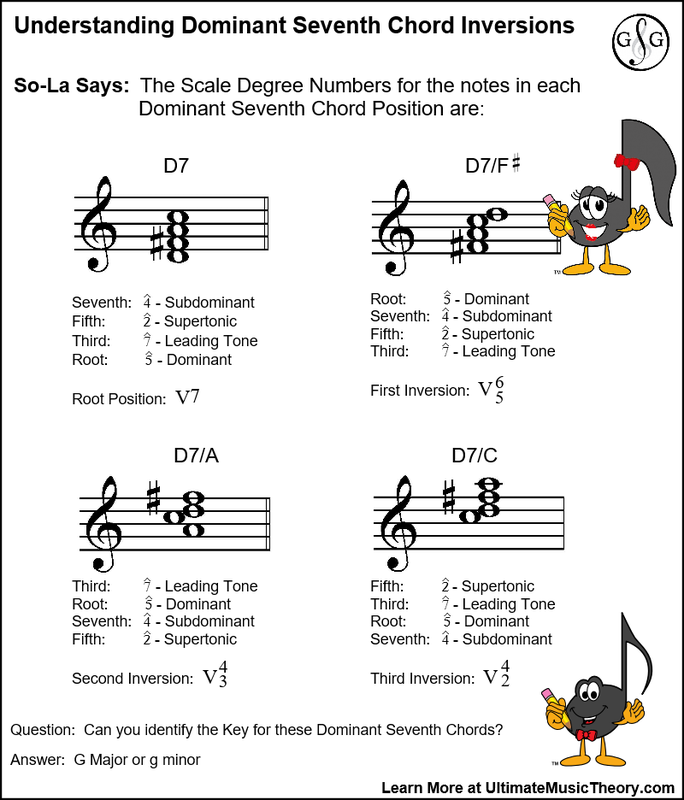 The first step is to identify the notes that you will use to write your Dominant Seventh Chord Inversion. The easiest way to do this is to write the notes in square "I am thinking" brackets. Notes inside square "I am thinking" brackets are not marked when an examiner "marks" the answer. 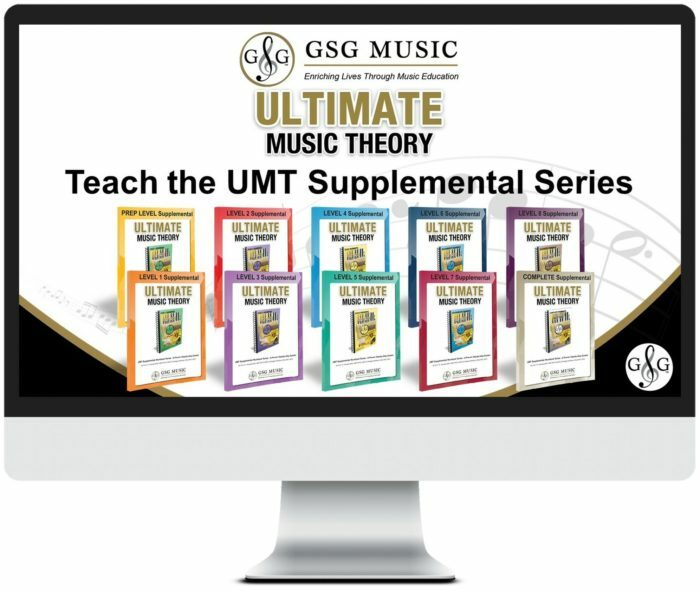 If you are not able to fit these notes in on the written page, use the Ultimate Music Theory Student (Small) Whiteboard. I cannot express how important it is for students to DO THIS STEP. We cannot expect Students to "see" these notes in their heads (as often happens with Teachers or advanced Students). To make sure that you know that your Student is actually going to use the correct notes, have them write them down! 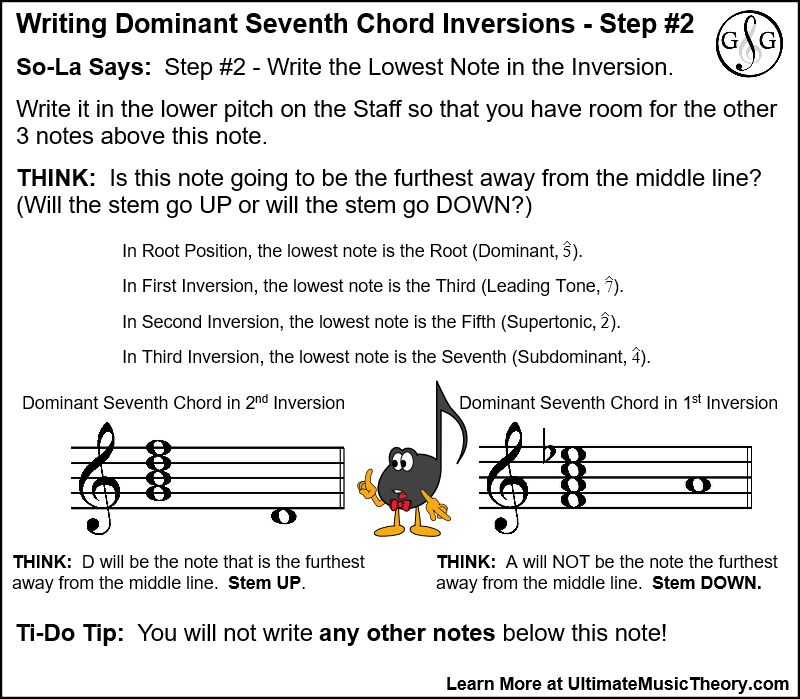 The second step is to identify the LOWEST note of the Inversion. Write this note as low as possible in the Staff. No other notes will be written below this note. Now, LOOK at this note. Remember that the STEM DIRECTION for notes in a Chord or Triad is based upon the stem direction of the note that is the furthest away from the middle line of the staff. Is this note written low enough so that it is indeed going to be the lowest note on the staff, the note that is the furthest away from the staff? If you are not sure, point with your pencil to the line or space where the highest note on the staff would be written (but don't write it). Which one of these 2 notes will be the furthest away from the middle line of the staff - the lowest (bottom) note or the highest (top) note? Yes, I know - we almost NEVER write Dominant Seventh Chord Inversions using any other note but whole notes. However, this is very (VERY) important for Step #3! So - would the placement of that lowest (bottom) note be the note that is the furthest away from the middle line (so that the stem would go UP)? OR would there be notes written above this note that would be further away from the middle line (so that the stem would go DOWN)? The third step is to add the Hugging Notes. 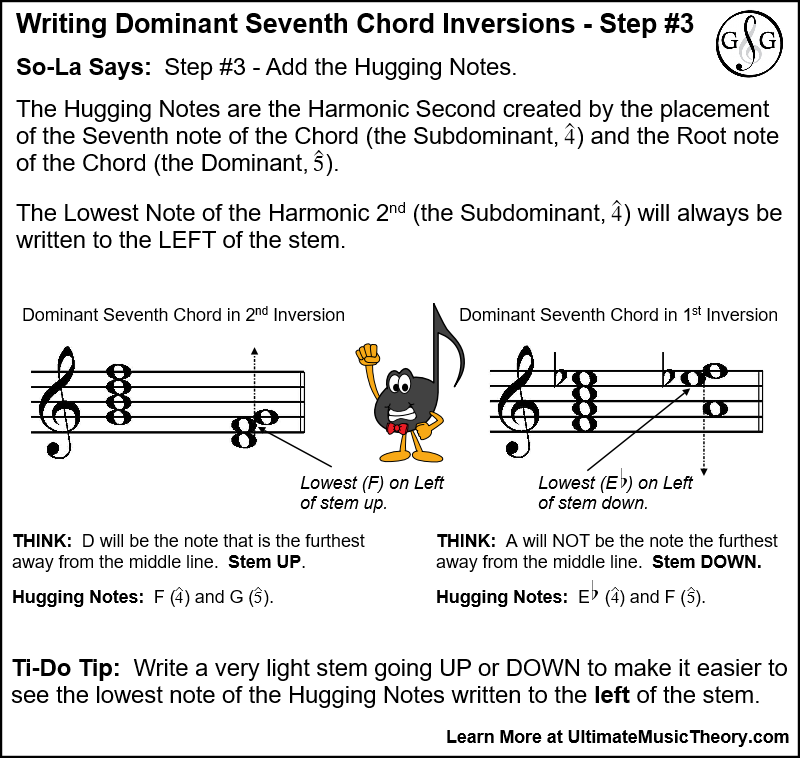 A Dominant Seventh Chord Inversion (first, second or third) will ALWAYS contain an interval of a Harmonic 2nd. This interval is created by the Subdominant Note (the Seventh note of the Chord) and the Dominant Note (the Root Note of the Chord) written together as a Harmonic 2nd. Remember that Stem Direction from Step #2? This is why it is of utmost importance: The Lowest Note of the Hugging Notes (the Subdominant Note of the Harmonic 2nd) will ALWAYS be written to the LEFT of that stem. If you do not write the Subdominant Note to the Left of that imaginary stem, then your note placement will be incorrect. It is OK to actually write a very light stem using your pencil so that you can SEE how the note is written to the left of this stem. Then you can erase the stem after you have finished writing this Chord. If that Stem is UP, the lowest note (the Subdominant) will be on the correct side of the stem and the upper note (the Dominant) of the Harmonic Second Hugging Notes will be on the "wrong" side of the stem. If that Stem is DOWN, the lowest note (the Subdominant) will be on the wrong (incorrect) side of the stem and the upper note (the Dominant) of the Harmonic Second Hugging Notes will be on the correct side of the stem. The Final Step is simply to add that final note so that your Dominant Seventh Chord Inversion contains all 4 notes. Remember that this note does NOT go below (under) the lowest note in your Chord. If you add the missing note below the lowest note in your Chord, you change the Inversion. So, do not do it! The stem is in the direction of the note that is the furthest away from the Middle Line of the staff. The lowest note in the Hugging Note Interval of a 2nd is on the left of the stem. If the stem is pointing DOWN, 3 of the notes will have the stem down on the left side of the noteheads and 1 note will have the stem up on the right side of the notehead (the "incorrect" side of the note). If the stem is pointing UP, 3 of the notes will have the stem up on the right side of the noteheads and 1 note will have the stem up on the left side of the notehead (the "incorrect" side of the note). 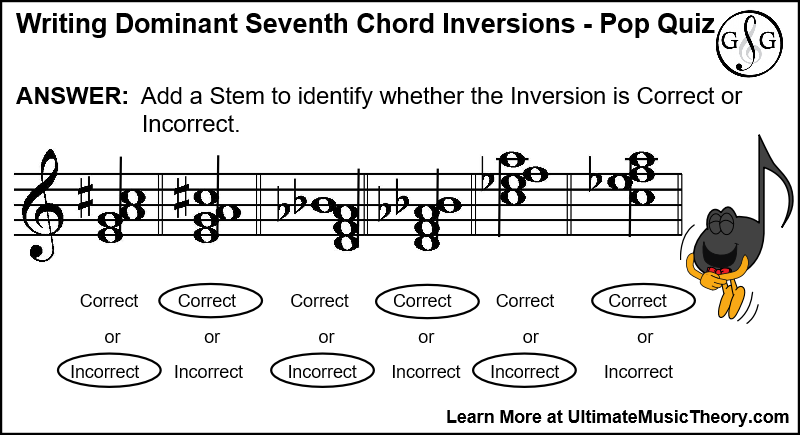 Writing Dominant Seventh Chord Inversions - POP QUIZ TIME! 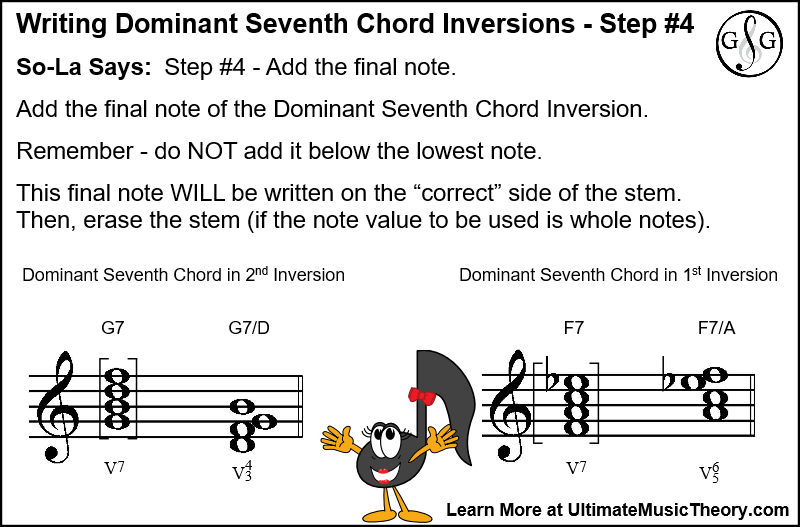 Here is the ONE TIP needed to know whether or not the note placement is correct or incorrect for your Dominant Seventh Chord Inversion: ADD a STEM!! If 2 notes are on the left side of the stem and 2 notes are on the right side of the stem, the note placement is Incorrect. If 1 note isn't even attached to the stem, the note placement is Incorrect. If 3 notes are not on the "correct" side of the stem (with 1 note ONLY on the "incorrect" or opposite side of the stem), then the note placement is Incorrect. Super helpful! Thanks for breaking it down into manageable steps!